An advanced, super high performance clp lubricant designed to perform in expanded temperature range conditions with lower pourable temperatures below freezing (tested to -44˚f) while maintaining high heat performance to above 700˚f. 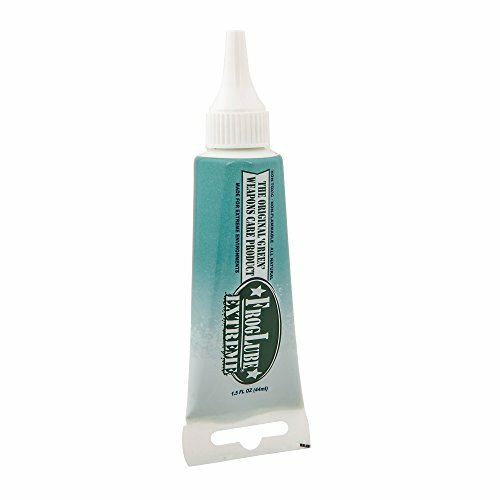 FrogLube extreme clp, is a very thin viscosity "light oil" in a 1.5 oz gel tube with twist open conical shaped applicator top. A dramatic improvement in the cleaning property comes from additives which enable the micronization of fouling particles. Contains 1.5 oz of FrogLube extreme clp liquid, all natural, food grade safe, anti-oxidant, water insoluble, temperature sensitive, full function firearms cleaner, lubricant and preservative. The precision applicator allows for the application of drops to precisely where its needed. Very thin viscosity "light oil"
If you have any questions about this product by Frog Lube, contact us by completing and submitting the form below. If you are looking for a specif part number, please include it with your message.